Masters of Science…oops… Social Engineering is a qualification which can be given to a person who is master in social engineering. You must be thinking that it is like that only, isn’t it? Yes, you are right but I am not referring to actual degree of MSe which universities provides, I am referring to the degree which are given by friends and colleagues to a person who is good in social activities. As any qualified person can use his/her degree either in good way or in bad way same is applicable to Masters of SE, some people use it for the help of others and society but some use it for the help of themselves. Such people can be found in your office, in your social life or at any other place which has involvement of many people. Let’s talk about office, in office or in your team you can find an MSe easily, such people become your good office friend and they are involved with you in official work and in your office social life. They laugh with you, they go with you anywhere but, when the moment of doing some work comes they start wiping sweat from their head and silently ask fellow colleague “yaar, ye dekhna kya he, dekhna zara isme kya karna he”. On such request if a fellow colleague helps him/her then they start giving instructions as if they know whole thing. They want full credit of the work assigned to him/her but they do not want to do it as they try to accomplish it through their social engineering skills. It’s not bad to help your fellow colleague but always helping them in each and every tasks allotted to him/her is not correct and it clearly shows that this person is incompetent. Such behaviors and practices effects team spirit. Team members refrain themselves to complain as their emotions stop them. The good part is that irrespective of the gags you do on them such people never get angry or irritated because they know they have to bear this if they want to be in the same team. They never take any panga with anyone and they are always ready to take out their wallet to make a payment. We have always heard about team work and such people gets benefit of team work, they do not contribute anything but take contribution from others and its always a dilemma to either complain about such people or to keep helping them and save their job. Haanji!! kya haal chaal? sab badiya, ek dum mast, tip taap? I hope ki sab badiya ho at your end. Well, I wanted to write this post before my post Show off but I was not able to stop myself to write it (why? read it and know it). So, we have shifted to a new apartment in a different society in same area. I don’t know why but I kinda love this area (Indirapuram) and when we came to know that we need to look for a new rented apartment then moving out of this area was not on my list. I am living in this area from the past 5 years and that might be the reason for my love to this area and its proximity. It was a month’s effort on property websites and interaction with property dealers to search a rented apartment which suits our requirements. I cracked this deal by the medium of an add posted on one of the property website (yes, no brokerage) and I felt good to see that still some land lord post their property’s advertisement on internet rather than including property dealers who let their apartment on a rent amount which actually do not deserve to be. Me: I mean hum party he…hume hi ghar chahiye. Me: Hum do log he, kyun? LL: Actually, jis family me bacche hote hein hum unhe ghar nahin dete rent pe kyunki bacche ghar kharab kar dete hein. Me: Ohh, that means aapke bacche nahin he. LL: Excuse me! aisa kyun lagta he aapko? Me: aapko ghar se jyada pyaar he na isiliye, never mind. Me: Noida me, Software company me, kyun? PD: Accha software me ho, phir to thik he, wo kya he na ki software waale jyada much much nahin karte. Me: Street light k neeche, sadak pe. Kyun aap ghar rent pe nahin doge kya? LL: Nahin wo baat nahin he, I just want to check whether you are a professional or not. Kabhi kabhi kuch dada type k log aa jate hein. Lady: Aap kahan kaam karte hein? Me: Ji, wo main aapke Land lord ko bta chuka hoon, aap ghar dikha dijiye. Lady: Nahin phir bhi kahan aur kya kaam karte ho? Lady: Accha, Motorcycle se Noida jaate ho job k liye, ok. In this area rent pe ghar dhoondhna wo bhi without broker is like aiming in the eye of a revolving fish with bow and arrow by looking at its mirror image. We went through this life learning lesson and realized that real estate sector is really booming and rates are touching sky these days. After all this jostling when we finalized our deal we took a breath of relief and tighten our back for shifting. Two days before shifting to new apartment we started packing and then we actually saw how much things we have in this 2 BHK. Palak said “OMG! itna samaan aaya kahan se…..kitna samaan he yaar humare pass”. Whatever it was we had to pack and we had cartons, cartons and cartons every where. Some how we got shifted to our battle won apartment with the help packers movers and got settled, but, still struggling to get broad band connection. Bechara humara laptop, from the day we came in to our new apartment it did not get the chance to connect itself to its peers in this electronic virtual word, it has not even come out of backpack. Arey!! sabse important baat,Many thanks to the god that Maids in this society are not rowdy and raunchy like maids in old society otherwise we have to again go through hiring and tantrums of kaam waali bai as I told before. I told Palak that she is lucky this time with the maid and lets hope this new home brings us more good luck. Fingers are crossed. We have often heard that these days Marriages are a medium for show off. Things like kind of decorations, varieties of food, kind of Marriage hall or farm house etc one has opted shows status of that family. Show off starts right from the marriage invitation card i.e. Marriage invitation card itself indicates which kind of marriage one is going to have. Show off from the type of Wedding invitation card can be understandable but show off from the content of wedding invitation card is some thing which can not be explained. One of my colleague who belongs to Tamilnadu is getting married and when we (our team) received his invitation card we were not able to believe our eyes. However we were not able to understand his card as it was printed in Tamil but few words in that card grabbed our eyes which made me write this post. Below are the edited scanned version of his card which we got on our email. I believe you are familiar with most of the qualifications which can be seen above but if you are not aware about TNEB then it is Tamil Nadu Electricity Board. Tradition of mentioning highest qualification with the name of bride and groom can also be seen in North India but for the first time I saw the designation and qualification of whole family mentioned in the wedding invitation card. Groom’s name is printed with his qualification, designation, company name and location. RSVP list also has qualifications. This may be the trend of marriages from Tamilnadu and I believe not only me but you have also not seen a wedding invitation card like this. I know, from the topic of this post you might have guessed about which thing I am going to write. On 5-May-2012, bollywood actor Aamir Khan’s show Satyamev Jayate got aired in which he raised/showed topic of female feticides in India. Show also talked about how ladies are mentally tortured by her husband and her in-laws to give a baby boy or abort the fetus if it is a girl. Educated and uneducated people of India are doing this, we can say that in majority, there are in-laws/husband who ask her daughter-in-law/wife to abort the girl fetus but the other fact which we cannot be ignored is that some pregnant woman also do this i.e. if a pregnant woman comes to know that the fetus is girl then she go for abortion with irrespective of what other members of her family want. Sounds cruel right? But it is also a fact. I came to know about a family which has three children, two elder daughters and one son. The lady of this family gone through three abortions before giving birth to her son and the surprising fact is that she was so much lost in the desire to get a boy that this lady convinced her husband to go for abortion. In this case we cannot blame any other family member other than this lady. There are also some cases where couple go for abortion because it happened by mistake and refer it as unwanted child. They are bringing a life in to this world and then they killed it just like erasing something with eraser. Cases of female feticide are more but I believe male and female feticide should be stopped. I am sure you do if you are from 80’s or before 80’s. These were the TV which played black and white movie songs “Ramaiya Vasta Vaiya, Ramaiya Vasta Vaiya….”. If we go back in that time then those were the days when black and white televisions were getting popular and people were getting them from the market. Those who were not able to purchase it they used to get it on rent to watch Sunday Programs mainly Chitrahar and movies on Doordarshan. From my faded memory I remember that we also got Weston’s Black and white TV. 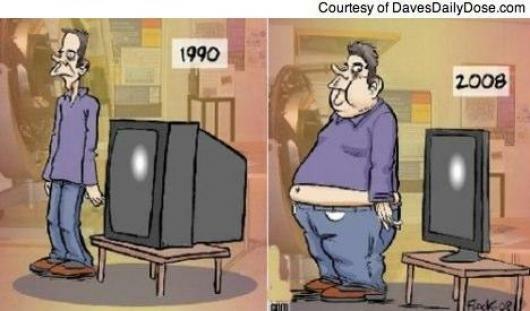 At that time, these Televisions were not providing power of remote control. Channels required to be changed manually from the control button on TV of course by the person who thinks himself/herself as capable of handling TV while these days buttons on TV are hidden somewhere in the television frame so that they do not spoil beauty of Television set. I remember when cable TV/private channels started people were much excited to see more than one channel on TV. Today as there are n number of channels we fight with each other to view a particular TV channel or we just zap channels to search some interesting content while in that time there were no such options, whole family used to sit together to watch whatever channel was showing. It was like a team building exercise which involved cooperation and satisfaction but nowadays everyone has got TV in their room and all watch what they want to watch. One thing is common between that time and today which is, still most of the homes have one TV but with the difference that either One is watching the TV channel of his/her choice or one is just watching it. Previously there was no remote control and these days one has to keep two remote controls with them, one for the TV and one for the STB, thanks for the STB providers. There was nothing like Parent control as Doordarshan never showed such content and Doordarshan used to be the very important channel at that time and today no one watch it, in fact I have even not tuned it on my TV. The fact is that being a government channel it is still free to air from the 80’s or may be before that to till date. 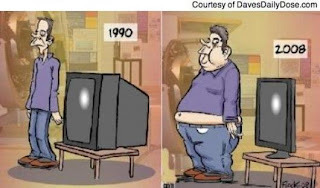 Technology has/is made/making TV slimmer and slimmer day by day while human is getting bulged day by day and below cartoon from internet shows that. Our next generation will never see old black and white Television sets and we can tell them that we have witnessed the launching of cable TV and DTH, IPTV Settop boxes.